Fleetwood Mac News: Steven Tyler to join Mick Fleetwood Blues Band as a special guest - Wednesday! Steven Tyler to join Mick Fleetwood Blues Band as a special guest - Wednesday! “Sweet Emotions” are starting to flow now that it’s just been announced legendary Aerosmith frontman Steven Tyler will be a special guest at the Fleetwood @ the MACC show at 7:30 p.m. Wednesday. “Get comfortable with legendary Fleetwood Mac founder-drummer and Maui resident and entrepreneur, Mick Fleetwood, in a living room setting on stage,” states a “hot-off-the-press” email release sent out from the Maui Arts & Cultural Center this morning. “Mick Fleetwood will talk story about his world travels, and there will be behind the scenes antics and musical influences. 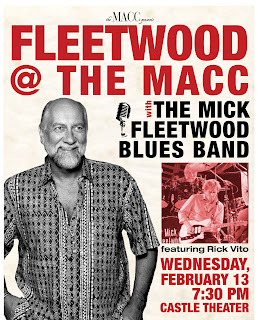 Then the 2010 Grammy Award nominated Mick Fleetwood Blues Band, featuring Rick Vito on guitar and vocals, Lenny Castellanos on bass and vocals and Mark Johnstone on keyboards and vocals, will perform their hits.” Rumour has it that Christine will also be up their jamming! If only I had my own jet...I think a bunch of us need to go in on one and split the costs while we charter ourselves around this spring and summer for the tour. if chris will join them then someone needs to video some of christine's songs, we the mac fans want to here her. please someone record this!! !